What Does a Bed Bug Look Like and Where Do I Find Them - Yes Pest Pros, Inc. What Does a Bed Bug Look Like and Where Do I Find Them - Yes Pest Pros, Inc.
For generations, the notorious bed bug was something that only existed in oddly inappropriate nursery rhymes we’d recite before we fell asleep. Today, bed bugs are a real threat as they may infest your home and cause you endless sleepless nights. However, if one crawled across your pillow, would you know what it was? Here, we will explore not only what does a bed bug look like, but where they can be found, as well. 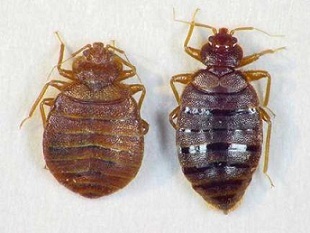 First off, it is important to note that a bed bug looks completely different after feeding than it does before. They grow in size considerably after taking in blood. The abdomen section of the bed bug fills with blood and becomes reddish in color. Prior to feeding, a bedbug has a decidedly brown or black hue. that they move around to sense what’s around them. Bed bugs are terrified of the light, much in the way roaches are, but since bed bugs are so much smaller than roaches, a person can have them in their home for months, suffering painful, itchy, rash-inducing bites night after night, without ever actually seeing a bug. That’s why it is so important to know where to find them. As the name suggests, a bed bug is usually found in your bed. If you have white or light coloured sheets, you may be able to see evidence of bed bug activity due to droppings being left behind and small, pinprick sized droplets of blood staining your top and fitted sheet. Once the sheets are removed from the bed, pull back the ribbon-like edge of the mattress and take a close look. Here you’ll find more tiny drops of blood, a whole lot of droppings, and maybe some live bugs. A bed bug only needs to feed once a month. They spend the rest of their time laying eggs and causing general mayhem. If you see something moving once you expose this part of your mattress to light, you likely have a problem. While bugs generally prefer the privacy and darkness of your mattress, it isn’t the only place they like to relax. Behind the headboard is a common resting place, as is the back of your bureau. You can sometimes find them under the sink in the bathroom or even under your bathmat. Any place that’s dark, warm and undisturbed can harbor bugs. There is a reason why roaches and bed bugs have been with us for millennia. They behave very similarly. If you feel that you have a pest control problem, contact the experts at Young Environmental Services. They can help you with all of your Bloomington pest control needs and get your home in tip top shape fast. Bed bugs don’t have to cause you any more sleepless nights. Call today.